Neck should be of medium length with a strong muscular appearance, tapering to the shoulders. Topline should show the hindquarters to be as high as or a trifle higher than the shoulders. Back should be short, well coupled and powerful. Chest should be strong, deep and wide. Rib cage barrel round and deep. Body is of medium length, neither cobby nor roached, but rather approaching hollowness from underneath as the flanks should be well tucked up. Tail of medium length; medium heavy at the base. The tail should be straight or slightly curved and should not curl over back or side kink. 2. Teeth overshot or undershot. 4. Coat curly or with a tendency to curl all over the body. 5. Feathering on the tail or legs over 1¾ inches long. 7. White on any part of the body except breast, belly, toes, or back of feet. The question of coat and general type of balance takes precedence over any scoring table which could be drawn up. The Chesapeake should be well proportioned, an animal with a good coat and well balanced in other points being preferable to one excelling in some but weak in others. Click Here to Learn about breeder background checks on Chesapeake Bay Retriever breeders if you are looking for Chesapeake Bay Retriever puppies for sale. Click Here to learn how ResearchBreeder.com can help you find healthy Chesapeake Bay Retriever puppies for sale. Click Here to order a Breeder or Kennel Background Check on Chesapeake Bay Retriever Breeders that may have Chesapeake Bay Retriever puppies for sale. 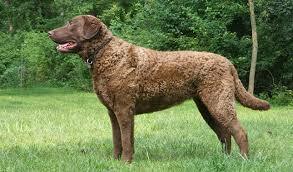 Click here to find the national breed club for Chesapeake Bay Retriever puppies for sale. Click Here to purchase a list of approved ResearchBreeder.com Chesapeake Bay Retriever Breeders who have Chesapeake Bay Retriever puppies for sale.